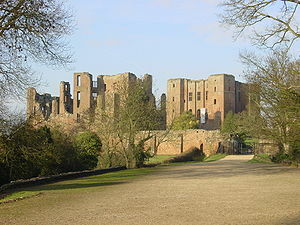 Warwickshire (pronounced /ˈwɒɹɪkˌʃə/, /ˈwɔːɹɪkˌʃə/, or /ˈwɔːɹɪkˌʃɪə/) is a county in central England. The county town is Warwick. The shape of the administrative area Warwickshire differs considerably from that of the historic county. Commonly used abbreviations for the county are Warks or Warwicks. Warwickshire is perhaps best known for being the birthplace of William Shakespeare from Stratford-upon-Avon. The county has also produced other literary figures such as George Eliot (from near Nuneaton), Rupert Brooke (from Rugby), and Michael Drayton from Hartshill. Warwickshire is bounded to the northwest by the West Midlands metropolitan county, and Staffordshire, by Leicestershire to the northeast, Northamptonshire to the east, Worcestershire to the west, Oxfordshire to the south, Gloucestershire to the southwest. The majority of Warwickshire's population live in the north and centre of the county. The market towns of northern and eastern Warwickshire were industrialised in the 19th century, and include Atherstone, Bedworth, Nuneaton, and Rugby. Major industries included coal mining, textiles, engineering, and cement production, but heavy industry is in decline. Of the northern and eastern towns, only Nuneaton and Rugby (as the birthplace of Rugby football) are well-known outside of Warwickshire. The rich towns of central and western Warwickshire include Leamington Spa, Stratford-upon-Avon, Kenilworth, Alcester, and Warwick. They have light to medium industries, services, and tourism as major employers. The south of the county is largely rural and has little population, and includes a small area of the Cotswolds. The only town in the south of Warwickshire is Shipston-on-Stour. The highest point in the county, at 261 m (856 ft), is Ebrington Hill on the border with Gloucestershire, GR SP187426 at its southwest extremity. There are no cities in Warwickshire since both Coventry and Birmingham were incorporated into the West Midlands county in 1974. The largest towns in Warwickshire as of 2004 are: Nuneaton (pop. 77,500), Rugby (62,700), Leamington Spa (45,300), and Bedworth (32,500). Stratford, Warwick, and Kenilworth all house populations with more than 20,000 inhabitants, the smaller towns of Atherstone, Alcester, Coleshill, Southam, Bulkington, Polesworth, Kingsbury, Henley-in-Arden, Studley, Shipston and Whitnash have populations between 5,000 and 12,000. Historically much of western Warwickshire, was covered by the ancient Forest of Arden (although most of this was cut down to provide fuel for industrialisation in the 17th to 19th centuries). For this reason, the names of a number of places in the northwestern part of Warwickshire end with the phrase "-in-Arden". Areas historically part of Warwickshire include Coventry, Solihull, and most of Birmingham. These became part of the West Midlands metropolitan county following local government re-organisation in 1974. Since 1986 Birmingham, Coventry, and Solihull have been effective unitary authorities, but they still remain legally part of the West Midlands. Coventry is effectively in the centre of the Warwickshire area, and still has strong ties with the county. Coventry and Warwickshire are sometimes treated as a single area and share a single NHS trust and ambulance service as well as other institutions. In 1931, Warwickshire got the town of Shipston-on-Stour from Worcestershire and several villages, including Long Marston and Welford-on-Avon, from Gloucestershire. This is a list of the main settlements in Warwickshire, including towns, or villages with a population of over 5,000. For a complete list see List of places in Warwickshire. This page was last changed on 22 October 2013, at 01:01.